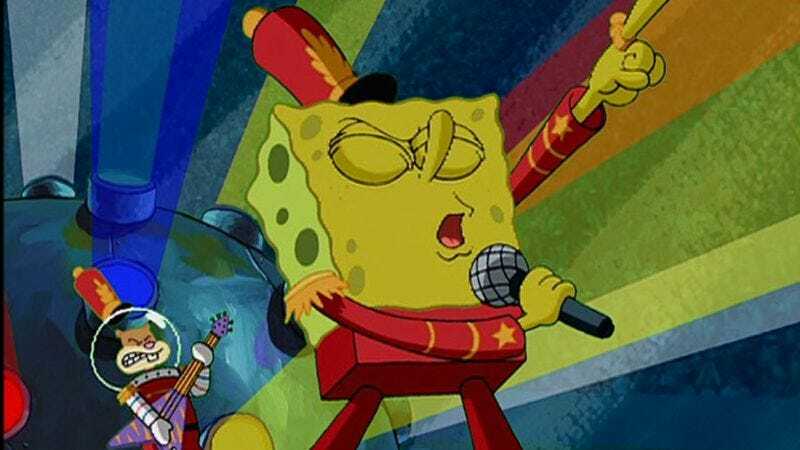 Nickelodeon’s SpongeBob Squarepants has always been a very musical show, from the incredible “Band Geeks” finale to the episode where Pantera did the music for some reason. It’s fitting, then, that SpongeBob will soon be making the leap to the big leagues of musical things: Broadway. As reported by Variety, Nickelodeon has announced that it is producing The SpongeBob Musical, a new theatrical production that will premiere in Chicago next year and move to New York shortly after that. The show will be directed by Tina Landau (Superior Donuts) from a book by Kyle Jarrow (A Very Merry Unauthorized Children’s Scientology Pageant), with Pulitzer-winning composer Tom Kitt as the musical supervisor. Those names aren’t familiar to a lot of the children and children-at-heart who love SpongeBob, though, so Nickelodeon will be hooking the less-cultured audience members with musical contributions from a list of big-name celebrity talent that is, frankly, absurd. Feel free to stop reading when you get to the point where you might actually want to see this: Steven Tyler and Joe Perry, the Flaming Lips, John Legend, Lady Antebellum, Cyndi Lauper, The Dirty Projectors, Panic! At The Disco, Plain White T’s, T.I., Jonathan Coulton (who also wrote additional lyrics), They Might Be Giants, and David Bowie. In other words, Nickelodeon shouting “Bring it on!” at Disney and all of the cartoons it has turned into Broadway shows over the years. Variety doesn’t know much about the plot (always the most important part of a SpongeBob episode), but it will apparently revolve around the eponymous sea sponge going on an adventure to “save the day.” That basically means nothing, but it’s all right because David Bowie is doing some of the music. David Bowie! No casting details have been announced yet, but we imagine Tom Kenny will be eagerly waiting by his phone.